This year proved to be yet another horrific year for floods and with millions stranded and homeless one had to come up with inventive ways to raise funds for them. Banglalink took a risk and put together a two daylong live concert to raise funds for flood affected people. The event was titled the Desh Music Fest 2007 and artists and bands from across the spectrum came forward to help. It was an enormous success and along the way thousands of music lovers were treated to a musical feast like none before. This week the Star Weekend Magazine caught up with three of the marquee bands from the festival. They represent the three distinct musical phases and generations Bangladesh has gone through, starting from the main man Ayub Bachchu, to the second and third generations of Artcell and Nemesis. These three bands and artists represent the ever-changing face of Bangladeshi music. 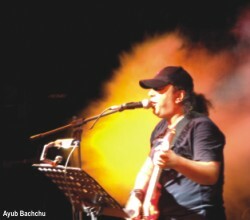 Ayub Bachchu, what more can one say about quite possibly the king of Bangladeshi rock. His name is synonymous with rock anthems around the country and his music is known by almost everyone. What endures him to his audiences are his legendary live performances where he is truly at ease. He has reinvented his music just about as many times as he has his appearance and is always a firm crowd favourite. A Bachchu guitar riff can be identified a mile away with its flamboyant elegance he is in the purest sense of the word a true rock star. He is what one might consider the first generation of rock musicians in this country, and he seemingly still rules the pack. How was the Desh Music Fest? It was absolutely unbelievable, I loved it and I am sure that the crowds loved it as well. The crowd was fantastic and they waited till the very end and were very well behaved. I am sure they liked what they saw because the performances were brilliant. Do you think the event lived up to its expectations? I most certainly do, the purpose of the fest was to help the flood victims and that would be done through raising funds. I think it lived up to the expectations and was a success as well. Here I must congratulate Banglalink for putting up a superb show which was well received, I hope they continue to raise funds for the flood victims and I wish them well. What do you make of the situation of band music now? I personally believe that the situation of band music now is quite good. But I must say that people should be confident of their work and style and should go out there and just perform like they want to. What are some of the new bands you like? Of the new bands I like Nemesis, Arbovirus, Artcell and Black, along with many many more. But I have one thing to say to them, don't stay under the logo of the underground scene, come to the mainstream. The kind of music they are playing is fantastic and they should be heard by more people. Also Ajob should be mentioned, they are doing a really good job as well. Let me simply say I live and die to perform live! The stage and the crowd are my oxygen and I need them to live. Trust me, that's the truth. Finally, you have great support within Bangladesh, what if any has been the response to your music outside the country? Well that is the funny part, we have played in some of the most famous venues around the world like the Wembley Arena, Madison Square Garden and in places such as Japan and Dubai, the response has always been great. There may not be as many fans as in Bangladesh, but they certainly react well to our music. Appealing to an overseas audience I must say is a real pleasure for me. Artcell is a band that truly needs no introduction, their fan base in enormous and their music is second to none. They took the route to the top which seems fairly familiar now, played all the underground shows and even came up with their own material. They first came to prominence with a single on a mixed cd and then came another one, before they knew it they were cutting a record, and what a record that proved to be. 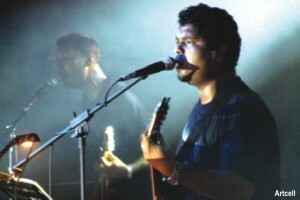 Their first solo album was a runaway success and it brought a new genre of music to the at times dated music scene of Bangladesh. They were truly torch bearers of the musical revolution. A string of hits led to their much hyped second album which took four years to make and it was truly well worth the wait as the re created themselves with a sound no one had hear before. They seemingly never stop playing concerts and caught up with us after the Desh Music Fest for a chat. What are you currently up to and what exactly are your future plans? Currently we are doing a lot of concerts and starting work on the new album. Things seem to be coming along well; all the concerts these days keep us quite busy. Our future plans revolve around releasing our third album and we have a checklist of things to do. The first is obviously our next album, but closely behind are plans to have two solo concerts, of which one will be unplugged. What was the response to the second album? We had great expectations to meet and to us we all lived up to our expectations. The crowd response was great as well, so I would say we succeeded at what we set out to do. The album was well received and aside from that as an album it was very thematic and that was an aspect which came off well. People question the time lag between the first and second albums, your response to that. To us the time between the first and second albums (4 years) was thoroughly justified. We thought Oniket Prantor was worth the wait, maybe our fans would have been happier with an earlier album but for us it was a case of quality over speed (laughs). What would you say are the differences between the first and second albums if any? There is a huge difference between the first and second albums. The first album was raw and hard hitting while the second was far more mature as a band we probably got better. The progression could be seen in every aspect of the album, just look at the lyrics and see how Rumman our lyricist evolved over the time, let alone ourselves. Well firstly as musicians we are very lucky to take part in some great events and help out like this. The Banglalink sponsored Desh Music Fest was a bold and huge initiative and most importantly it entailed a lot of hard work. At the end of the day I think it was a resounding success. On a personal note these kinds of events are the least we can do and we honestly considered ourselves lucky to participate in such an event. The fact that we could help people by playing music was simply great. On a different note it was also a huge platform for many budding musicians to perform with the big guys in front of a big audience and that was definitely good for them. Finally, would you prefer to be known as an underground band or mainstream? We prefer to be known as an underground band (laughs) but I am not sure if that is the case. Nemesis is a band that has done the rounds for some time now and with the release of their first solo album and singles on various mixed albums they have hit the music scene hard. Their success came the good fashioned hard way, plying their trade in underground concerts they garnered a huge fan following and then there was only place they could go from there, and that was up. They represent the latest stage in the musical development of Bangladesh, from covering U2 to writing their own lyrics in a hugely successful album they have risen above their underground status while still staying true to it. They are the third generation of modern Bangladeshi musicians and having recently played at the Desh Music Fest 2007 they share their views on a number of different topics. As a band what are you up to now? Slacking off, as usual. However, we have been getting our compositions in to position. We're trying to hit up a deal with a production house soon. We should be starting our recording process soon! As for the near future, we're planning to hit the studio. Considering the peak season for shows and concerts, we're pretty much booked for the next couple of months. As soon as we get our sponsors ready for our next album, we'll start recording. In most circles you are labelled an 'underground' band, is that still the case? We really don't think labelling helps anyone's case. Underground is simply a scene. An underground band is rather a vague term and means very little to us. What in your opinion would be the difference between an underground and a mainstream band? Is it necessarily better to be mainstream? The term "underground" is frequently misused. Underground is simply the opposite of mainstream. As far as we're concerned, this terms holds little meaning. We simply consider ourselves as a rock 'n roll band. However, between 'underground' and 'mainstream' one cannot really say which is better. We believe it is completely an individualistic opinion! Mainstream is mostly commercial music, unlike underground. So at the end of the day, to each his own. Your fan following is quite large, what do you attribute that to? Well, simply put, we love the way we compose and connect with ourselves on stage. I guess that gives off a natural feeling of connectivity to the crowd, which is original. Plus, we think our song selection for a set was quite powerful when we were starting off, and even now, we suppose! The magnitude of the music fest was great and it was nice to see so many bands come together for a good cause.